This is a bath salt series by Earth Chemical Co., Ltd. (アース製薬) The company was established in 1892 in Osaka, Japan. they offer a wide range of bath additives (more than 50 items) under different brand names within and outside of Bath Roman (バスロマン), but this webpage helps finding what you want by filtering the products based on milkiness, scent, type, color.. (if you know Japanese). There is also a Hot Spring Tour series, but for now I have only tried their skin care type ones sold in a containers. These are my favorite for now, as all the four kinds of bath powders I tried I really loved, and my absolute favorite is Bath Roman Bihada Pure Rose. These products are also great value – unless you have to pay for the shipping from Japan – I bought the 680g containers for 10-14 dollars, and they should be enough for at least 20 baths (you can use as much as you want). Some of their products, like the Hot Spring Tour ones are made in China, most others in Japan. The Bihada ones are cosmetic skin care products containing AHAs, collagen, ceramide, papain enzyme, to refresh and moisturize the skin. There are three varieties: Pure Rose, White Lily and Jasmine. My favorite is Pure Rose, which is like a dream. It has an amazing, sweat Rose scent and lovely light pink, milky color, and the water feels like it is more moist than water! :) As it it were creamy. Can’t describe, but it’s great, and makes my skin feel good and soft. Rating: 5+/5. I also tried the White Lily, which has a milky white color, maybe with a little bit of light blue in it, and Lily fragrance. The flower scent is rather strong – depending on how much you use, but I’d say it’s for women. 5/5. 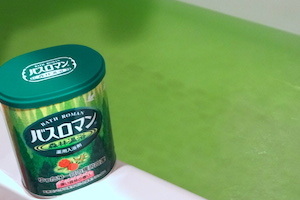 Finally I bought a Forest (森林 shinrin) Bath, which is not milky, but clear and makes the water green and smell like a forest. It is a relaxing bath salt with herbal essence. Helps ease shoulder ache, back ache, cold and fatigue. This is also very nice. 680 g, should be enough for appr. 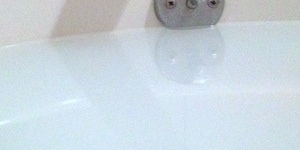 22 baths. 4/5. Later I added the Sakura (cherry blossom) one to the collection as well, it doesn’t have such a realistic scent, but it has a nice, milky pink color. 4/5. If you wonder what else you can find, they have a whole list of scents and colors here, I think the company has a pretty awsome, useful website.